Holliday Bickerstaffe Kendall was born on 2 August 1844 at Wakefield, Yorkshire, to parents Charles Kendall and Sarah Bickerstaffe. Charles was a PM Minister. From a young age Kendall read widely and voraciously. He started his working life at the age of fourteen in a printer’s office. During two years apprenticeship in Scarborough, he mastered French, and when transferred to Grimsby he added knowledge of shorthand. Kendall surrendered himself to the service of Christ at the age of eighteen after hearing a sermon by the Rev. Charles Spivey. He was quickly called to the local pulpits, where his fresh thought and easy natural style soon became well known. He was soon a hired local preacher at Barton on Humber whilst still ‘On Trial’. Soon after entering the ministry, Kendall took a course in Latin in Newcastle. He then added sufficient Greek to matriculate at Durham University. Following a University course for two years, Kendall obtained his Bachelor of Arts whilst stationed at Spenymoor. His five years at Middlesborough were marked by a great religious awakening. After a year on his next station, Harrogate, Kendall had a breakdown and had to ask for a temporary superannunation. 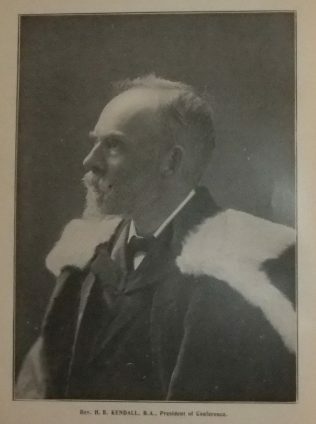 During this period, although unable to preach, he accepted the position of Principal of a Training College for young ministers at East Keswick, nr Leeds, where he taught and trained men for Newfoundland, Canada, the United States, Australia and the Wesleyan colleges at home. Kendall became vice-Editor in 1892, and Editor in 1892. The normal appointment of five years was extended to nine as a result of the success he achieved in that role. In conjunction with Professor Peake, Kendall represented the denomination on the Committee which prepared the Free Church Catechism. Kendall was the Hartley Lecturer in 1901; his subject being “Christ’s Kingdom and Church in the Nineteenth Century. Kendall was President of Conference in 1901. After his year as President, Kendall retired from the active ministry and moved to Bournemouth. During his retirement he wrote the volumes for which he is probably best known; The origin and history of the Primitive Methodist Church. 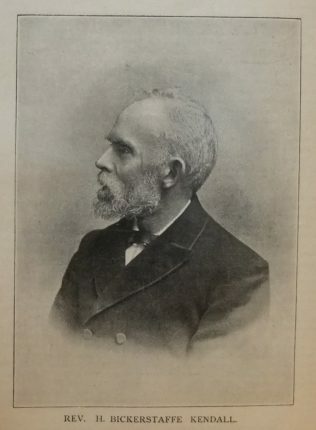 The 1917 Primitive Methodist Magazine contains an extended interview with Kendall in which he reflects on the early PM pioneers he met as a child and in his early ministry, as well as his reflections on the development of the church during his lifetime. It makes very interesting reading. Christ’s kingdom and church in the nineteenth century , 1901. History of the Primitive Methodist Connexion, 1902. ‘What hath God wrought!’: a centenary memorial of the Primitive Methodist Church. He was also a prolific contributor to the Ambassador, Review and PM Magazine. Kendall married Martha Sissons (1844-1940) in late 1868 at Hull, Yorkshire. Martha was baptised by William Clowes. Census returns identify twelve children. Holliday Bickerstaffe Kendall died on 10 March 1919 at Bournemouth, Dorset.